Tim Philpot has served as a trial lawyer, state senator and now as a family court judge in his hometown of Lexington, Kentucky, where he lives with his wife, Sue, and plays golf without apology. 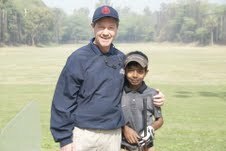 Tim’s current hobby is serving as a volunteer assistant golf coach at the University of Kentucky. In 1959, Ford Philpot brought every ounce of his down-home, tent-revival charm to television’s fertile ground and became the first true TV evangelist, telling The Story of Jesus to every household with a screen and a pair of dusty rabbit ears. But once the cameras stopped rolling, Ford knew just where he would go next: the golf course. In this delightful memoir of his father, Ford’s son Tim spins tales of the man’s sometimes profound, sometimes contradictory life. Ford’s Wonderful World is full of humor, honesty, and deep appreciation.